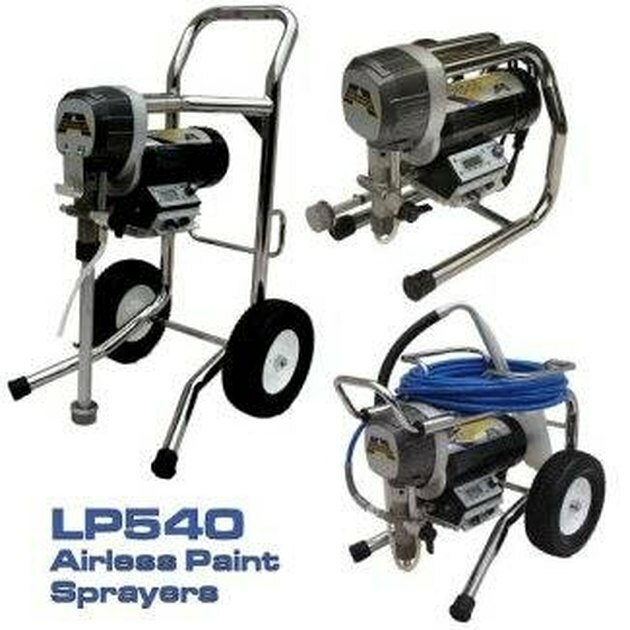 If you have never used a paint sprayer, using one for the first time is an eye-opening experience. Not only does a paint sprayer help finish any painting project faster, sprayed paint also looks better and in less work than rolling and brushing. But after the job is done, it is very important to clean the paint sprayer thoroughly, inside and out. When you are finished painting for the day, place the intake hose of the paint sprayer into a bucket of water (for latex-based paints) or lacquer thinner (for oil-based paints). Using scissors, shears, or a sharp knife, trim the bristles of a cheap paint brush to 1-inch in length. Pour about 2 cups of either paint thinner or lacquer thinner into a small plastic cup or bucket. Disassemble the spray gun and place all gun parts into the lacquer thinner to soak. Put a pair of protective gloves on (blue nitrile gloves work well). Put some lacquer thinner on a clean cloth rag and rub the oversprayed paint off of the frame and body of the paint sprayer. Using the trimmed paint brush, begin cleaning the paint off of the spray gun. The shorter bristles will help add some abrasive action along with the solvent to work any stubborn paint residue away. Filter the used lacquer thinner using a clean cloth rag and put the used thinner back into the original container for reuse.